In the UK Bechstein's bat (Myotis bechsteinii) is very rare, occurring mainly in Dorset, Wiltshire and Hampshire and is absent from Ireland. It is a medium-sized bat with long broad ears. It seems to be a bat of ancient mature forests because bones found in some cave deposits show that it was much more common 3,000 to 4,000 years ago, before Britain's wildwoods were cleared for agriculture. Ancient woodland is defined as land that has been continuously wooded for at least 400 years. The bad news is that this type of habitat now covers just 2% of the UK. Emerges only after nightfall and has a fluttering agile flight high up in the tree canopy. Its echolocation calls are very quiet and so is very difficult to pick up with a bat detector at ground level. One tactic used by researchers from Sussex University on these quiet bats is to play back part of their call causing them to come and investigate. They can then be caught and radio-tagged so that their tree roosts can be located. 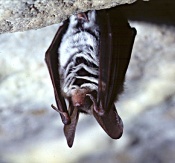 In continental Europe it breeds in bat boxes and has been recorded in rock hollows. No summer roosts are known in Britain. Since it is a very rare bat, protection of nursery roosts is very important. It is mainly found in tree holes and rarely in buildings. Occasionally found in caves and tunnels, but probably also hibernates in tree holes. Usually roosts in fairly exposed positions in colder parts (3-7°C) of underground sites. Usually hangs free with ears held well forward and parallel. Found in hibernation sites between October and March but mainly in the months of December and January. Colour Pale to reddish brown fur, light grey underneath. Mating Period Autumn to spring. Maternity Colonies From end of April/May. Colony Size 10 - 30 females. Young: 1 born end of June to beginning of July. Summer Roosts Tree holes and larger bat boxes, buildings occasionally. Winter Roosts Caves, cellars, mines, tree holes. Feeding Habitat Woodland bat. Also found in parks, pine forests, parks and gardens. Food Moths, mosquitoes and beetles.